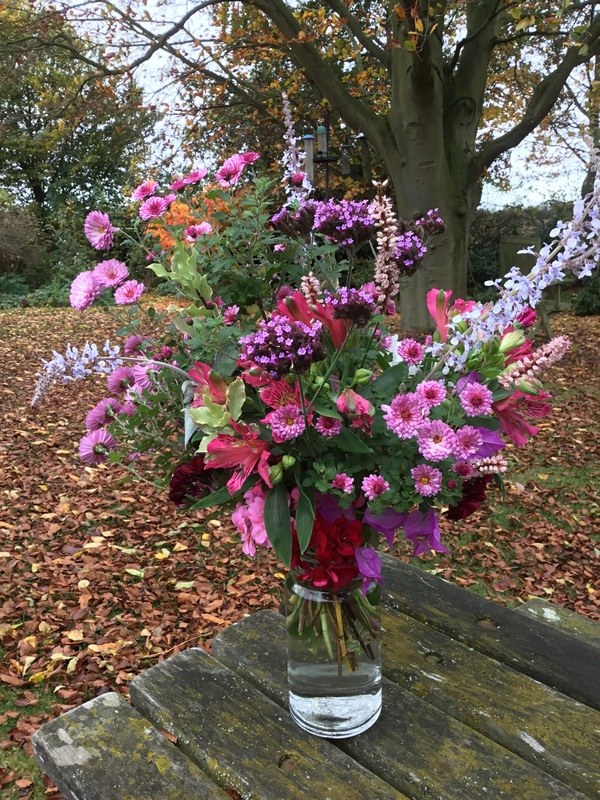 Our mild and sunny autumn has been a bonus for gardeners this year. 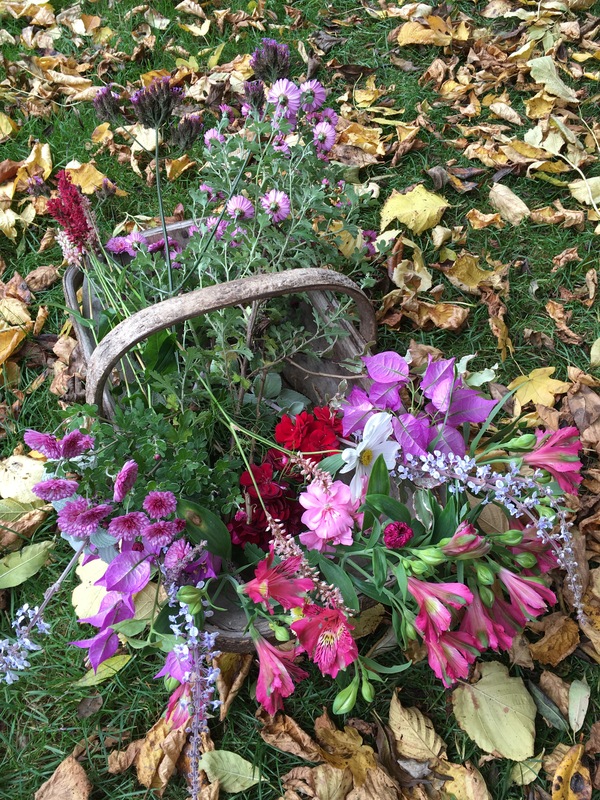 Flowers usually past their best by the end of September have carried on into November. Here I am continuing my tradition of running around the garden once a week and picking whatever is in flower for my Mother-in-law, Joan. It’s a flavour of my garden that I am after – now my in laws are too elderly to visit us and see the garden for themselves. The flowers are loosely tied with string- and not arranged- as Joan takes great delight in making her own floral creations and placing them on the all the windowsills in the house. In the centre of the bouquet is some Verbena bonariensis grown from seed. It’s flowered virtually all summer and been a magnet for bees. Seeds for cut flowers come from Higgledy Garden. There’s some spikes of Persicaria Orange Field and deep red Persicaria Firetail. These flower July to October and are long-lasting in a vase. The spikes give a contrast to the daisy- like flowers of chrysanthemum Mei-Kyo. Chrysanthemum Mei-Kyo is one of the last to flower in my garden. It’s totally hardy here and doesn’t need staking. Flowers last for at least two weeks in a vase. My chrysanthemums grow at the base of the sweet pea canes on my cut flower bed. They do best in full sun, but these are growing on the north side of the hazel rod trellis. They grow to about 60cm high with a 50cm spread. Good quality plants come from Woottens plant nursery. 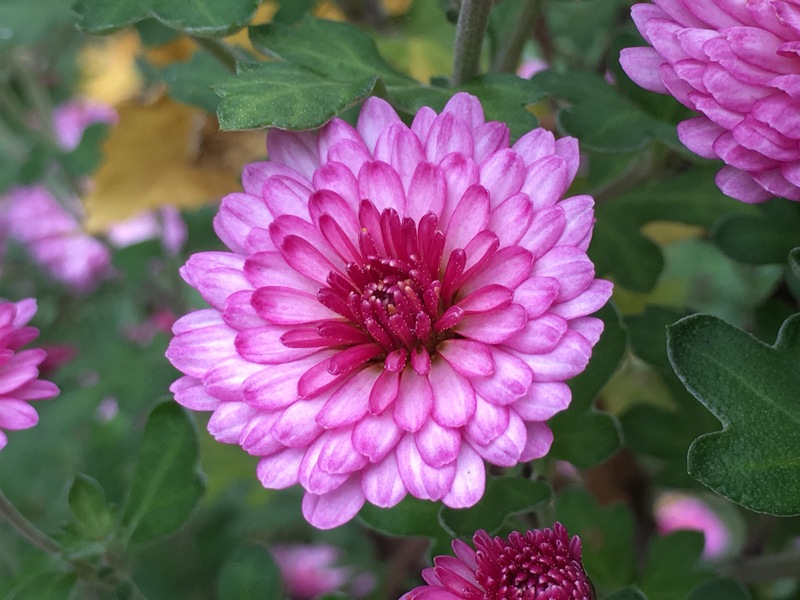 I’ve been looking at their on-line catalogue for new additions to my plot and I rather fancy a chrysanthemum called Aunt Millicent- just for the name itself! It’s a very pretty pale pink flower with a greeny yellow centre. More like a daisy than a chrysanthemum. 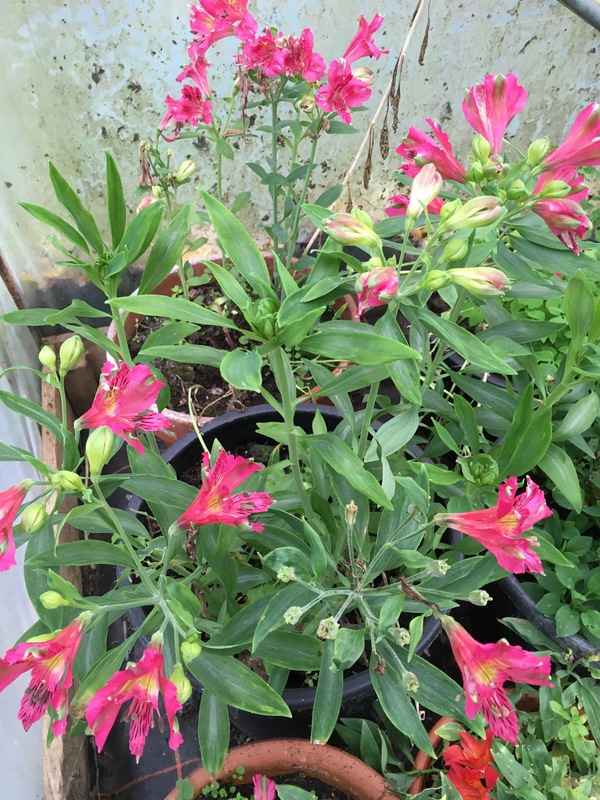 Bright pink alstroemerias are growing in large 40cm plant pots in my poly tunnel. These provide flowers nearly all year round. Flower stems are pulled rather than cut, and this encourages them to produce new flower stems. Tall stemmed varieties suitable for cutting are sold by Viv Marsh Postal Plants. I’m hoping to add a white variety called Blushing Bride to my collection next spring. The poly tunnel, bought second hand for £20, needs a good clean. Another winter job. It’s much harder to keep the polythene skin clear of algae than for a greenhouse. But it gives me a 20ft space to work during wet weather- and provides winter protection for a mini orchard of peach trees. Cathy at Rambling in the Garden started this meme three years ago, and it shows how gardeners from all over the world grow cut flowers and use them to decorate their homes. I hope you’ve enjoyed this tour around my garden and the flowers grown for Joan. Thank you Mike. If you look at the photo of the chrysanths this, you can see the stems of the the white cosmos growing through them. Cosmos grows so light and high up, it doesn’t seem to bother the chrysanthemums at all. So two plants in the space of one. So to speak. I love that you take the flowers to your MIL; My MIL sees my garden only through the blog now as she, too, is too old to travel. It was she who first introduced me to flower arranging and has inspired me with gifts of books. You have a lot of flowers still. thanks for the links to the suppliers especially for the Alstoemerias. 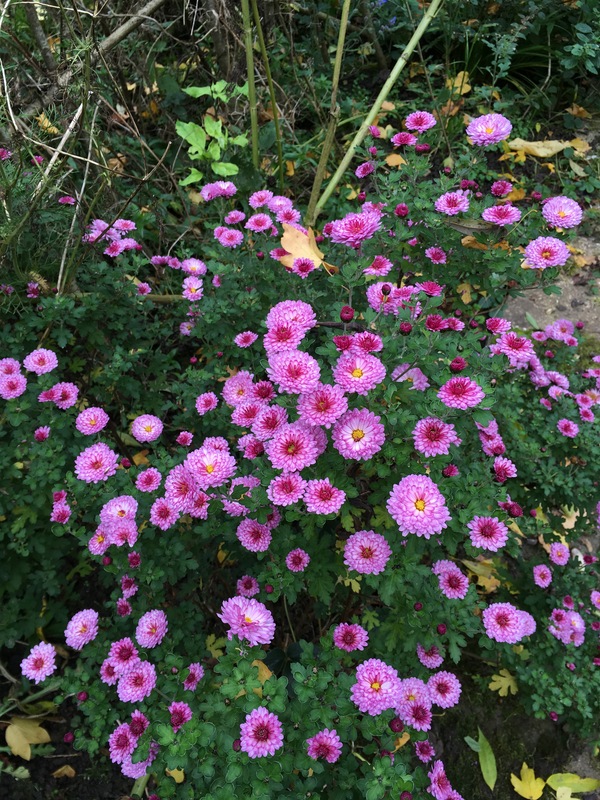 It’s lovely that your MIL can see your garden via the blog. New technology is keeping us all better connected. My MIL is amazing, she can make just a few twigs and three stems of flowers look like a whole bouquet. It’s a skill for sure. She did the chapel flowers for 65 years. I watched each week as she took flowers from her own garden to make the chapel look beautiful. I’ve learned such a lot from her. Even little things, like saving and re-using every resource. The string I use to tie up the flowers is returned to me each week in a neat little bow to re use. And the foil I use to keep the stems fresh is flattened and folded. I’m glad you find the links useful. I dithered over whether to use them. But it seems a good idea to share info on companies that have given great service and good plants. I’ve been looking for Altroemerias for a while. I have one plant I bought here but it has short stems. I’ve been using the dwarf Princess series as ground cover here. I’ve been really happy with all the plants supplied by Viv Marsh. They are large 1.5lt pots, not plugs or bare rooted,and flower in the first season of planting. They are really well packaged, and the staff are ever patient with all my enquiries. I’m keen to support family nurseries like this one. What a colorful post, love it! Thank you. I think there looks like more flowers if I stick to one colour range. They would be fine in the greenhouse. Growing them in large pots protects them from slugs. I’ve found the secret to success is to pull each flower rather than cut it off. It seems to send instructions to the plant to produce more flower shoots. It’s really easy to grow chrysanths from cuttings. Would you like me to post you some? Thanks for the info – I must remember that about pulling the stems rather than cutting them. And yes please, I will gratefully accept some chrysanth cuttings if it is not too much trouble – shall I email you address details? Forgot to say…. yes, 20ft long poly tunnel. It was bought From a plant nursery that was closing down. The purple bracts are bougainvillea. I’ve got a standard shrub with a round head that sits out on the terrace all summer. It’s just gone back in the greenhouse for the winter. Wondered if it might be bougainvillea – such a gorgeous purple. And isn’t it a bit late in the year to be flowering, particularly if it has only just come inside? The bracts stay colourful until about February. They dry and fade and I spray them silver for Christmas. I trim it back by about 50cm all over in March and it goes outside in May. I wish it was warm enough to be outdoors all year. Blooming perishing -1 here today. Wonderful post! Such a treat to see such colourful flowers at this point in the season. Thank you Belinda. Thanks for taking the time to post a comment. It’s much appreciated. Lovely to see the flowers with the autumnal backdrop. Chrysanthemum Mei-Kyo is a real star. Definitely worth checking out, especially if it is hardy. We’ve had -3 for the last few nights and the chrysanthemum is still pristine. Sadly every one of the asters shrivelled up over night. So I’m growing more chrysanths next year. They do get a degree of protection from being planted at the base of the hazel twiggy sweet pea trellis. And any sprawly growth can be tied to the canes. Thanks for taking the time to comment again. You have a lovely blog Karen. I’ve enjoyed scrolling back through past posts. I really like your philosophy too. Your bouquet of flowers is so beautiful and makes me yearn to add chrysanthemums to my plot again. I will look at your links for more inspiration. A 20 foot poly tunnel sounds like a great retreat on a wet day. Thank you Anna. I’m happy to pass on any little tips on growing- as I seem to learn something new every day. Mostly by accident. Thanks for taking the time to comment. It’s much appreciated. Thank you Annette for your kind comments. I’m currently doing battle with the beech tree leaves-trying to corral them into one corner. They will make lovely leaf mound….if I can just get the better of them. Sometimes ot’s just nice to see them swirl around, so don’t battle too hard. How I miss the old beech trees in our Irish garden, my favourite tree really. That’s a great tip about pulling rather than cutting the Alstroemeria, thank you for sharing. And what a stunning arrangement.